The iPod Nano (stylized and marketed as iPod nano) is a portable media player designed and marketed by Apple Inc. The first generation model was introduced on September 7, 2005, as a replacement for the iPod Mini, using flash memory for storage. The iPod Nano went through several differing models, or generations, since its introduction. Apple discontinued the iPod Nano on July 27, 2017. Development work on the design of the iPod Nano started only nine months before its launch date. The Nano was launched in two colors (black and white) with two available sizes: 2 GB (roughly 500 songs) and 4 GB (1000 songs). On February 7, 2006, Apple updated the lineup with the 1 GB model (240 songs). Apple also released some accessories, including armbands and silicone "tubes" designed to bring color to the Nano and protect it from scratches, as well as a combination lanyard-earphone accessory that hangs around the neck and avoids the problem of tangled earphone cords. The current models with Bluetooth headphones have a similar advantage. On September 7, 2005, Apple introduced the iPod Nano at a media event with Steve Jobs pointing to the small watch pocket in his jeans and asking, "Ever wonder what this pocket is for?" Advertising emphasized the iPod Nano's small size: 40 millimetres (1.6 in) wide, 90 millimetres (3.5 in) long, 6.9 millimetres (0.27 in) thick and weighing 42 grams (1.5 oz). The stated battery life was up to 14 hours, while the screen was 176×132 pixels, 38 millimetres (1.5 in) diagonal, displaying 65,536 colors (16-bit color). 1, 2, and 4 GB capacities were available. On November 11, 2011, Apple announced a recall on this model of iPod nano. The recall was issued due to a battery overheat issue. This recall applied to iPod nanos sold between September 2005 and December 2006. On September 25, 2006, Apple updated the Nano line. The second-generation Nano featured scratch-resistant, anodized aluminum casing like the earlier Mini's design; the multiple color choices mirrored those of the Mini as well. However, unlike the second-generation Mini, the button labels were grey instead of matching the Nano's casing (except for the black Nano, which had a black click wheel). The second-generation Nano featured a 40% brighter, "more vibrant" display, a battery life upgrade (from 14 to 24 hours), and storage sizes doubled to 2, 4, and 8 GB models. The second generation also introduced gapless playback of audio files, along with a new search option. The 2 GB model was available in silver only. The 4 GB was initially available in green, blue, silver, or pink, and the 8 GB model was initially only available in black - red was later added for 4 and 8 GB models. Apple claimed that the second generation iPod Nano's packaging was "32% lighter with 52% less volume than the first generation", thereby reducing environmental impact and shipping costs. A (Product) Red second-generation iPod Nano. On October 13, 2006, Apple announced a special edition iPod Nano; Product Red, with a red exterior and 4 GB of storage. For each red iPod Nano sold in the United States, Apple donates US$10 to the Product Red initiative, while retaining the regular price. On November 3, 2006, Apple introduced a red 8 GB model, due to "outstanding customer demand", again retaining the same price point of the equivalent black model. A black 8 GB 3rd generation iPod Nano. Apple updated the Nano again on September 5, 2007. The third-generation Nano featured a 2-inch (51 mm) QVGA (320 x 240) screen and a shorter, wider, heavier design, with new colors. New features included browsing via Cover Flow, a new user interface, video playback, and support for new iPod Games. Users had to repurchase games bought a month before the debut of the new iPod as they were not supported. The Nano was announced in a 4 GB version coming in silver and an 8 GB version coming in silver, turquoise, mint green, black, and Product Red. The battery lasted for approx. 24 hours on audio playback and approx. 5 hours on video playback. On January 22, 2008, Apple released a pink version of the 8 GB iPod Nano. Combining elements from previous generations of the iPod Nano, the third-generation Nano had an aluminum front plate and a stainless steel back plate. The Nano also sported a new Minimalistic hold switch, similar to the iPod Shuffle's power switch, which had been moved to the bottom of the player. The 2-inch (51 mm) screen had the smallest dot pitch of any Apple product, having the same pixel count as the 2.5-inch (64 mm) display of the iPod Classic. On October 6, 2007, Apple released a firmware update (1.0.2) via iTunes that was said to improve Cover Flow and yield faster menu navigation. The update was also released for the iPod Classic. On November 28, 2007, Apple released another firmware update (1.0.3) via iTunes, which included unspecified bugfixes. January 15, 2008 saw the release of version 1.1, which added support for iTunes movie rentals, music song lyrics support and included more unspecified bugfixes. Apple released update version 1.1.2 in May 2008 and version 1.1.3 in July 2008 with even more bug fixes. At the Apple Let's Rock Event on September 9, 2008, the iPod Nano Fourth Generation was officially announced. It returned to the narrow form factor of the 1st and 2nd Generation model, while retaining and rotating the 51-millimetre (2.0 in) screen from the 3rd gen model. It was also thinner than the first, second, and third generation Nano, measuring 90.7 millimetres (3.57 in) tall by 38.7 millimetres (1.52 in) wide by 6.2 millimetres (0.24 in) thick, and weighing 36.8 grams (1.30 oz). It had a curved aluminum shell and glass screen (the glass screen being held in place with nothing but the shell). Apple claimed the battery would last 24 hours of music playback, and only 4 hours of video playback, compared to the 5 hours of the previous generation. The six previous colors (silver, black, mint, turquoise, berry red, and rose pink) were replaced by silver, black, purple, light blue, green, yellow, orange, red, and pink, for a total of nine, although the Product Red color was only available directly from Apple (website and retail stores). Apple marketed the new colors as "Nano-chromatic". Also added was an accelerometer which allows the Nano to shuffle songs by shaking it, the option between portrait and landscape display modes by tilting the iPod left or right, and access to Cover Flow when tilted sideways. Videos, however, could only be played in landscape mode. The user interface was also refreshed, adding a more stylized look in keeping with the new hardware design. It included a new voice recording feature which started automatically when an Apple compatible microphone is plugged in. It also included the new "Genius" feature, introduced by Apple the same day. The Genius feature automatically creates playlists based on a selected song using an algorithm built by Apple. It was additionally touted as "the most environmentally friendly iPod Apple has ever made", containing arsenic-free glass and a BFR-, mercury-, and PVC-free design. It was also claimed to be highly recyclable. The iPod Nano fourth-generation was shipped in cases similar to the second-generation ones with the clear view in the front, and is marketed in three models: 4 GB (limited production to Europe only) and 8 GB and 16 GB. Limited quantities of an unannounced 4 GB model surfaced in various markets. Also, the iPod Quiz game was dropped and replaced with a Maze game which makes use of the iPod's accelerometer similarly to such games on the iPhone and iPod Touch. The fourth generation dropped support for charging via FireWire. "This change means that any dock accessories that use the dock connector's FireWire pins to send power—many older speakers and car chargers, for example—will not charge the fourth-generation iPod Nano." 5th generation iPod Nano camera and microphone. At Apple's September 9, 2009 event, a fifth generation iPod Nano was unveiled with reduced prices on the larger model (at the time of release, the 8GB was priced at $149 and the 16GB at $179), a larger, 56.3 millimetres (2.22 in) diagonal screen (up from 50.8 millimetres (2.00 in) in third and fourth generation iPod Nanos), which was also wider, integrated video camera with 16 special effects, microphone, FM Radio with iTunes tagging (via RDS) multiple radio regions including Americas, Asia, Australia, Europe, and Japan. As well as continuing to support picture viewing and video playback, it also included Live Pause, a built-in pedometer, Nike+iPod Support and a speaker. This model also had the Genius Mix feature installed. The headphone jack and dock connector swapped locations so that the headphone jack was to the left of the dock connector. Therefore, the fifth generation iPod Nano used a different Apple Universal Dock insert than the fourth generation. The fifth generation iPod Nano had nine finishes: Silver, Black, Purple, Blue, Yellow, Orange, Product Red, Green and Pink. All have a glossier, shinier finish than the fourth generation. Just like the fourth-generation iPod Nano, Product Red and the yellow Nano were only available on the Apple Online Store and Apple Retail Store. This generation was discontinued on September 1, 2010. At a media event on September 1, 2010, Apple announced the sixth generation iPod Nano, which, among many new features, was designed around a high resolution square touch-screen. The device featured a small 1.55 inch multi-touch screen with a lower resolution of 240×240 pixels but a higher pixel density of 220 pixels per inch, as opposed to the larger 2.2 inch screen on the fifth-generation iPod Nano. The device had a 0.39 watt-hour battery rated at 3.7 volts, giving a capacity of 105 mAh, and specified to give 24 hours of music playback on a single full charge. The device takes about three hours for one full charge. The device retained the same 30-pin dock connector as previous generations. This Nano lost the previous generation's video camera, built-in voice recorder microphone (although plugging in headphones with a built in microphone revealed a Voice Memos app) and built-in speaker, and games. It also lost support for video playback, but music videos and video podcasts (vodcasts) could be synced onto the device, and the audio from them would play on the device, with a single key-frame shown on the screen. It still included the Nike+iPod fitness option as well as an FM radio tuner with RDS (Radio Data System). It had a black on white screen contrast option and other accessibility options. The 6th generation iPod Nano had the same price point as the 5th generation device. A firmware update (version 1.1) for the Nano was released on February 28, 2011. The update added the ability to change songs or pause with a double click of the sleep/wake button. It also added the ability to turn the device off by holding the sleep/wake button. The user interface was also enhanced. On October 4, 2011, the iPod Nano 1.2 update was unveiled at the Apple "Let's Talk iPhone" event at the Town Hall, 4 Infinite Loop. This update added the option to increase or decrease the size of the home buttons for easier use. The update also added a better fitness app, which had a better pedometer split into walking and running style. The update also included 16 new clock faces, which included designs like a Nixie tube clock face or an old-style clock face, and Disney-licensed designs, such as Mickey Mouse and Kermit the Frog, bringing to a total of 18 clock faces. Three more background images were also added. Although not specifically designed as one, some accessory makers produced watchbands for the 6th generation Nano, allowing it to be worn like a watch. In September 2013, TUAW compared the iPod Nano to the Samsung Galaxy Gear, and considered the three-year-old model to be a "better, cheaper smartwatch" than the Galaxy Gear because of its more complete functionality in comparison, and its inclusion of a headphone jack. A 2015 model of the 7th-generation iPod Nano having the Product Red color scheme. Apple announced the seventh and final generation iPod Nano on September 12, 2012. The (maximum) internal storage capacity has not been increased compared with the previous model but only a single, 16GB version of the seventh generation iPod Nano was announced at the product launch. It has been described as the "thinnest iPod Nano yet". (Apple put it, "Our thinnest iPod ever.") It is 38% thinner (5.4 mm) than the Nano it replaces (8.78 mm), and adds the ability to use Bluetooth 4.0 wireless headsets, speakers and other devices (such as heart-rate monitors). It still included the Nike+iPod fitness option as well as an FM radio tuner which works when connected to headphones or a stereo jack. On 15 July 2015, Apple refreshed the iPod Nano, offering only 5 more subdued colours (gold, silver, blue, pink and space grey) compared to the original 7 jewel tones, in addition to the (Product) Red model. On July 27, 2017, Apple discontinued the iPod Nano, along with the iPod shuffle. The 7th generation featured a 2.5 inch, 432x240 display at 202 PPI, Bluetooth 4.0 (with support for NIKE+iPod wireless systems), and a Lightning connector to replace the original 30-pin dock connector. It does not run on iOS, but some may make the mistake of classifying the 7th generation iPod Nano as an iOS device. The current and final version of the iPod software for this device is 1.1.2. Replaced Mini. Colour screen for picture viewing; 1 GB version released later. Anodized aluminium casing with plastic top and bottom; 6 colours available. 51 mm QVGA screen; lighter color shades and chrome back; new interface; video-playing capability. Polished aluminium case including a larger screen, video camera, built-in microphone, FM radio tuner, Recorder and a pedometer. Retains entire color line from fourth generation. Multi-touch screen. No click-wheel, camera, or video playback. The 1.1 OS update brought the ability of turning off by holding the wake/sleep button. Same price range as the 5th generation, except in Europe, Japan and Australia. Features iOS-like interface design and still contains "shake to shuffle", FM radio, and pedometer. The 1.2 OS update added built-in accelerometer support which works with Nike+iPod without the need to attach a Nike+ receiver or shoe sensor. New, larger 2.5 inch Multi-Touch screen, and "Home button" similar to iPhone but does not run iOS. Unibody now made of anodized aluminium. Also, with larger screen, supports video playback. The 30-pin dock connector has been replaced by the new Lightning connector. Bluetooth 4.0 wireless connectivity. New "Space Gray" color option replaces "Slate" as of September 10, 2013. New colors were introduced on July 15, 2015. Discontinued on July 27, 2017. ^ a b c d e f g h Is a Special Edition color exclusively available on Apple's website. The size of the package was reduced 50 percent with the introduction of the 2nd generation. The 4th and 5th generation packaging mimics this packaging, while the 3rd generation used a larger but otherwise similar version of it. The initial consumer response to the iPod Nano was overwhelmingly positive and sales were heavy. The Nano sold its first million units in 17 days, helping Apple Inc. to a record billion-dollar profit in 2005. Apple's release of the iPod Nano as a replacement for the iPod Mini was viewed by many as a risky move. Steve Jobs argued that the iPod Nano was a necessary risk since competitors were beginning to catch up to the iPod Mini in terms of design and features, and believed the iPod Nano would prove to be even more popular and successful than the iPod Mini. Within days of the Nano's release, some users reported damage to the Nano, suggesting that the LCD screen had become so scratched that it was unreadable, even when the backlight was on. Many reported fine scratches on Nanos, caused by microfiber cloths. Other owners reported that their Nano's screen cracked without use of excessive force. On September 27, 2005, Apple confirmed that a small percentage ("less than 1/10 of 1 percent") of iPod Nanos shipped with a faulty screen and agreed to replace any that had cracked screens, but denied the iPod Nano was more susceptible to scratching than prior iPods. Apple started shipping iPod Nanos with a protective sleeve to protect them from scratches. In October 2005 a class action lawsuit was filed against Apple, with the plaintiffs seeking reimbursement for the device, legal fees, and "unlawful or illegal profits" from sales of the iPod Nano. Lawyers for the plaintiffs claimed that the devices "scratch excessively during normal usage, rendering the screen on the Nanos unreadable, and violating state consumer protection statutes". Similar lawsuits were later filed in Mexico and the United Kingdom. In early 2009, Apple was in the process of settling a court case over the scratched iPod Nano screens. It was suggested that Apple should set aside $22 million to refund users. At the time, it required a Judge's sign-off on the terms by April 28, 2009. Some commentators such as BusinessWeek's Arik Hesseldahl have criticized the lawsuits. Hesseldahl dismissed them as "stupid" and suggested that they benefitted "no one but the trial lawyers," but also suggested that Apple could have avoided litigation by offering "full refunds on unwanted Nanos" instead of charging a re-stocking fee and lengthening the return period from 14 days (when purchased through Apple retail or online) to 30 or 60 days. In Australia, an iPod Nano caught fire while being charged on a PC. In another incident, a man's iPod Nano set his pants on fire while he was working at Hartsfield-Jackson Atlanta International Airport. In addition, an iPod Nano sparked in Japan in January[when?] while it was recharging. Although no one was injured during the incident, Apple Inc. investigated the incident. It was reported on August 19, 2008 that 17 incidents of abnormal overheating with first generation iPod Nano units while recharging had been reported in Japan, including cases in which tatami mats had been charred. On August 10, 2010, Apple Japan released a statement saying that it would replace any iPod Nanos that overheated. Since 2010, users have been reporting the 6th generation iPod Nano's sleep/wake button remains stuck after months of use, making it impossible to activate the device without the help of a computer or a dock accessory. According to a technical inspection, the device uses double-sided tape to hold the button in place, indicating a possible design fault. On November 11, 2011, Apple announced the iPod Nano (1st generation) Replacement Program, intended to address concerns over overheating batteries. Customers with affected devices can fill out a claim form to confirm eligibility for replacement. Defective devices will be replaced within six weeks and will carry 90-day warranties. Customers who have personalized iPod Nano devices will not be able to receive personalization on their replacement devices. During the replacement process, there have been several reports of users receiving an iPod Nano 6th generation as replacement instead of the expected 1st generation device that users sent in during the recall. Because using the iPod nano 6th generation with a Mac computer requires iTunes 10 or higher, which in turn requires Mac OS X Leopard system software, Apple will upgrade the system software of participants running earlier versions of OS X, on request[citation needed] but this leaves users that do not have access to iTunes without a working device (because Apple changed the hashing of the music database which prevented the 6th generation iPod Nano from being used with open source software via libgpod). ^ a b "Apple discontinues iPod nano and shuffle". 9to5Mac. July 27, 2017. Retrieved July 27, 2017. ^ a b "Apple Introduces iPod Nano" (Press release). Apple Inc. September 7, 2005. Archived from the original on October 18, 2012. Retrieved December 23, 2006. ^ Huddleston, Jr., Tom (July 27, 2017). "Apple Is Discontinuing the iPod Nano and Shuffle". Fortune. ^ Grossman, Lev (September 12, 2005). "Stevie's Little Wonder". Time. Retrieved October 3, 2006. ^ "Apple Unveils New 1 GB iPod Nano at $149". Apple press release. Apple Inc. February 7, 2006. Archived from the original on December 23, 2006. Retrieved December 23, 2006. ^ Pachal, Peter (October 8, 2011). "Remembering Steve Jobs: His Best Keynote Moments". PCMag.com. Retrieved November 15, 2011. ^ "iPod nano (1st generation) Replacement Program". Apple Inc. November 11, 2011. Archived from the original on November 12, 2011. ^ "Apple Introduces the New iPod Nano" (Press release). Apple Inc. September 12, 2006. Archived from the original on October 18, 2012. ^ "Apple – Environment". Apple.com. Retrieved November 29, 2011. ^ "Apple Announces iPod Nano (PRODUCT) RED Special Edition". Apple press release. Apple Inc. October 13, 2006. Archived from the original on January 14, 2007. Retrieved January 13, 2007. ^ "Apple Announces New 8GB Model of iPod Nano (PRODUCT) RED Special Edition". Apple press release. Apple Inc. November 3, 2006. Archived from the original on January 4, 2007. Retrieved January 7, 2007. ^ "iPod Classic, Nano updated to 1.0.2". MacNN. October 6, 2007. Retrieved January 22, 2008. ^ Ricker, Thomas (September 9, 2008). "Official: iPod nano reaches 4G, looks tall for its age". Engadget. Retrieved September 12, 2008. ^ "Identifying the 4th Generation iPod Nano". About.com. Retrieved April 29, 2009. ^ a b Topolsky, Joshua (September 17, 2008). "Official: Mysterious new 4GB iPod nano 4Gs begin appearing on store shelves". Engadget. Retrieved September 17, 2008. ^ Frakes, Dan (September 16, 2008). "Fourth-generation iPod Nano". PC World. ^ a b "iPod nano new features". Apple.com. Retrieved November 29, 2011. ^ "iTunes – Partner with iTunes". Apple. Retrieved September 2, 2010. ^ "Learn about Apple Universal Dock". Support.apple.com. April 22, 2010. Retrieved September 2, 2010. ^ "Apple unveils new TV box for renting movies, shows – Yahoo! News". News.yahoo.com. Retrieved September 2, 2010. ^ "iFixit – iPod Nano 6th Generation Teardown: Page 1". iFixit. September 8, 2010. Retrieved September 11, 2010. ^ "iFixit – iPod Nano 6th Generation Teardown: Page 2". iFixit. September 8, 2010. Retrieved September 11, 2010. ^ a b c d e "iPod nano – Read the technical specifications". Apple. Retrieved September 2, 2010. ^ Starrett, Charles (September 9, 2010). "iLounge.com – iPod nano 6G plays music videos, vodcasts as audio". iLounge.com. Retrieved September 11, 2010. ^ Horwitz, Jeremy (October 4, 2011). "New details on iPod nano 6G software 1.2". iLounge.com. Retrieved October 4, 2011. ^ "iPod Nano Watchband Shootout: TikTok vs iWatchz Q". Gigaom. Retrieved January 24, 2014. ^ "Confused by the Galaxy Gear? Apple released a better, cheaper watch in 2010". TUAW. AOL. Retrieved January 24, 2014. ^ "Apple Introduces iPod nano". Apple Inc. September 7, 2005. Archived from the original on October 18, 2012. Retrieved March 1, 2010. ^ "Nano 1G". freemyipod.org. November 21, 2014. Retrieved November 21, 2014. ^ "Apple Introduces the New iPod nano". Apple Inc. September 12, 2006. Archived from the original on October 18, 2012. Retrieved March 1, 2010. ^ "Nano 2G". freemyipod.org. November 21, 2014. Retrieved November 21, 2014. ^ "Nano 3G Logic Board". FreeMyIPod.ORG. ^ a b c "Which iPod has the best quality audio?". Macintoshhowto.com. Retrieved November 17, 2012. ^ "Fitness Updated". Apple.com. Retrieved November 29, 2011. ^ Apple unveils new iPods, including gold color options Retrieved on July 20, 1025. ^ "Apple and the Environment". Apple.com. Apple Inc. Archived from the original on August 21, 2006. Retrieved October 22, 2006. ^ Myers, Michelle (September 10, 2005). "Apple store buzzes with Nano fever". CNet. Retrieved September 15, 2005. ^ Daniel Drew Turner (October 11, 2005). "Apple Hits $1 billion in Profit for 2005". eWeek. Retrieved January 3, 2006. ^ Burrows, Peter (September 13, 2005). "iPod nano: Will small size mean big sales?". BusinessWeek. ^ Angell, Larry (September 25, 2005). "iPod nano screen complaints abound". iLounge. Retrieved September 27, 2005. ^ Dalrymple, Jim (September 27, 2005). "Apple responds to iPod Nano screen concerns". Macworld. Retrieved September 28, 2005. ^ Jade, Kasper; Katie Marshal (October 21, 2005). "iPod Nano owners sue Apple over screen issues". AppleInsider. Retrieved October 21, 2005. ^ "Nano lawsuit goes international". BBC News. November 8, 2005. Retrieved May 10, 2006. ^ "Apple Settles iPod Nano Scratch Lawsuit with $25 Refund". Macrumors.com. January 23, 2009. Retrieved November 29, 2011. ^ Hesseldahl, Arik (October 27, 2005). "iPod nano Lawsuits: Who Wins?". BusinessWeek. Retrieved November 8, 2005. ^ "Exploding iPod dies gruesome death". Engadget. April 12, 2007. ^ "Gadgets: iPod nano Explodes During Charge". Gizmodo. April 2, 2007. ^ "iPod Sets Man's Pants On Fire – News Story – WSB Atlanta". Wsbtv.com. October 5, 2007. Archived from the original on June 29, 2011. Retrieved November 29, 2011. ^ "iPod nano Sparks Investigation in Japan – GridLock – Just another KM / Tech Blog". Arjunthomas.com. Retrieved November 29, 2011. ^ iPod nano emits sparks, Japan's government says[permanent dead link], Tech News on ZDNet. ^ "Apple says to replace overheating iPods in Japan". Reuters. August 11, 2010. Retrieved September 2, 2010. ^ Koh, Yoree (August 12, 2010). "Apple Japan to Swap iPods that Overheat". The Wall Street Journal. Retrieved September 2, 2010. ^ View: Everyone Only Notes (September 19, 2010). "Stuck sleep/wake button? : Apple Support Communities". Discussions.apple.com. Retrieved March 2, 2014. ^ "iPod Nano 6th Generation Stuck Buttons". Rbarrios.com. Retrieved March 14, 2017. ^ Pollicino, Joe (December 21, 2011). "Apple reportedly swapping recalled iPod nanos for 6G counterparts; you have yours?". Engadget. Retrieved December 21, 2011. ^ "Libgpod - gtkpod iPod Manager". Gtkpod.org. October 15, 2011. Retrieved November 17, 2012. ^ Apple Inc., Apple press release library, Retrieved September 19, 2007. ^ Mactracker (mactracker.ca), Apple Inc. model database, version as of July 26, 2007. 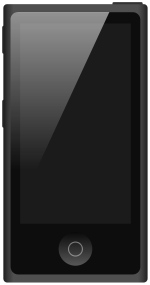 Wikimedia Commons has media related to IPod Nano. iPod Nano – archived official site on Apple Inc.